Over the years, and in several different sports, Jason Dote has been involved in more tournaments than he can count as a player, coach and parent. But the upcoming Shootout for Soldiers on July 16-17, a 24-hour lacrosse event and family-fun festival and fundraiser for veteran’s organizations, is different. Dote will play on alongside all of his children – Madison, 15, Grant, 13, Sawyer, 10, Layton, 9 and Murphy, 4 – in the father-daughter, and father-son games. And his wife, Meredith Dote, is on the organizing committee, which is led by Merry Troper. Other games will feature youth, high school, college and adult teams. “I guess I’ll be there for all 24 hours,” said Jason Dote, whose Columbus Ballhawgs, a 35-and-older team, play at 1 a.m. on the 17th. This is the second year Columbus has been part of Shootout for Soldiers, which was started by a group of high school students in Maryland in 2012 to benefit veterans and support their transition into civilian life. It began with one 24-hour tournament in Baltimore and now features eight sites/events and has raised more than $900,000 for veteran’s charities. “It’s important to give back to our soldiers,” Troper said. 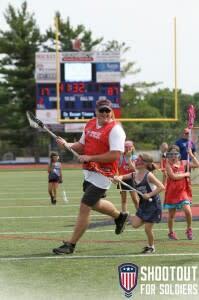 This is why she and several others involved with lacrosse at Thomas Worthington applied to host the event in 2015. And, the fact that lacrosse has grown exponentially in central Ohio in recent years helped to seal the deal and bring Shootout for Soldiers to the area. Other sites for Shootout for Soldiers are: Boston, Baltimore, Atlanta, Texas, Long Island, Colorado and California. 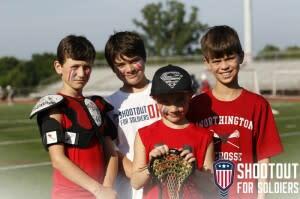 About 800 players on 48 teams took part in a series of one-hour games on two fields at Thomas Worthington last year. They raised about $45,000 and more than 6,500 people turned out to watch. The opening match on Saturday will feature two teams of soldiers. This year there will be at least 55 teams participating. Admission is free, and there will be music, food trucks, activities for kids, and plenty of lacrosse action. Each team that participates is required to raise a minimum of $750, and 100-percent of the money raised will benefit the following organizations: Army Ranger Lead the Way Fund, Gary Sinise Foundation, Semper Fi Foundation and Team Red, White & Blue. These are all national charities, and each of the local Shootout for Soldiers event organizers also select two local charities. Troper and her team selected Buckeye Military Moms and Honor Flight Columbus. Representatives from all the organizations will attend Shootout for Soldiers at Thomas Worthington and have tents set up near the fields. The Shootout for Soldiers has been a hot topic of conversation in the Dote household, one that’s filled with lacrosse sticks and equipment. Click here for more information on Shootout for Soldiers. The Opening Ceremonies begin at 12:30 p.m. on Saturday and include an Honor Guard. The first game – featuring two teams of soldiers, begins at 1 p.m.